The Silly BooDilly: Dyeing to Stitch: Blog Tour and GIVEAWAY! Dyeing to Stitch: Blog Tour and GIVEAWAY! 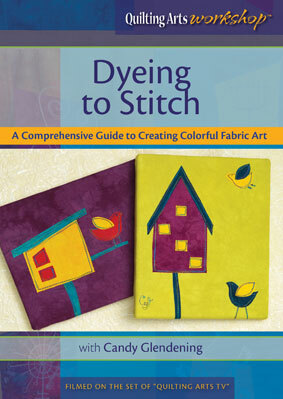 It is with great pleasure that today I get the honor of kicking off Candy Glendening's Dyeing to Stitch DVD blog tour! 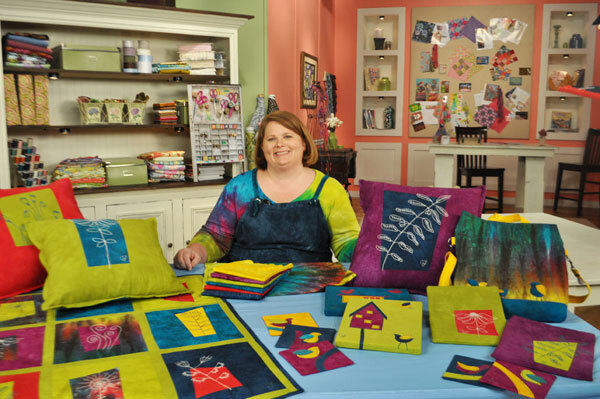 I first met Candy last year when we were both in Ohio filming segments for Quilting Arts TV. Having Candy there as part of the experience was like having the sun, (with a spectacular rainbow above) right there with you; as she was that warm, that friendly, that full of energy, and that spectacularly colorful! It was the first time for both of us, but watching Candy in front of the camera... well, you would never have known that she was a TV virgin, as she took to it like a duck to water. When her taping was over, everyone of us watching from the green room burst into applause, as we were so impressed! No wonder then that Candy was invited to come back and film her very own DVD for the Quilting Arts Workshop series. Last week I got a chance to preview Candy's new DVD, and it was like watching an old friend... partially because it was so nice to see her in action again, but also because that is simply how Candy makes you feel... like she is an old friend... and a fun and talented one, too! 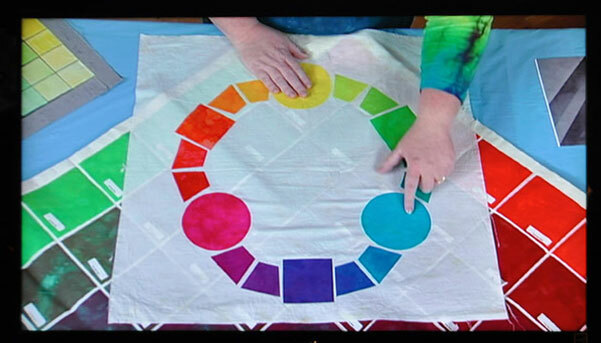 In her Dyeing to Stitch DVD, Candy walks us through the steps of her dyeing techniques. Breaking down the steps in a very user friendly way, she shows us exactly how to measure, mix and dye fabrics using the same low water immersion method that she uses to dye all of her fabrics, and provides 6 recipes to create her jewel toned color pallet. Now, you should note that along with being a textile artist, Candy is also a scientist. Really. She teaches biology at the University of Redlands... how cool is that?! This might explain why her DVD is so absorbable. Candy knows how to present information, how to make it interesting and informative. Watching Candy talk about color theory was great! I was fully engaged and totally enthralled as she showed her amazing hand-dyed “Candiotic Table of Elemental Color”, pictured above. Is that not AMAZING!?! And last but not least, Candy demonstrates her wonderful “free motion machine sketching” and the fun ways she uses her fabric! Okay, and here is the best yet... Candy is offering one of my lucky blog readers a chance to win their own copy of Candy's Dyeing to Stitch DVD! Just leave a comment, and make sure I have a way to contact you should you win. I will keep the contest open for one week, and announce the winner in my next post thereafter. Update: 11/18/11 - Giveaway is now closed. Thanks to everyone who entered! I will be announcing a winner later this week. For more chances to win a copy of Candy's DVD, follow the tour and visit the other blogs listed below! Wow! this looks a great book - it's going straight to the top of my Amazon wishlist! Great stuff, would love seeing such shows here in Switzerland. I'm very interested in low water immersion dying-sounds like DVD needs to be on my wish list! What a wonderful opportunity to have a chance to win the Dyeing to Stitch DVD! 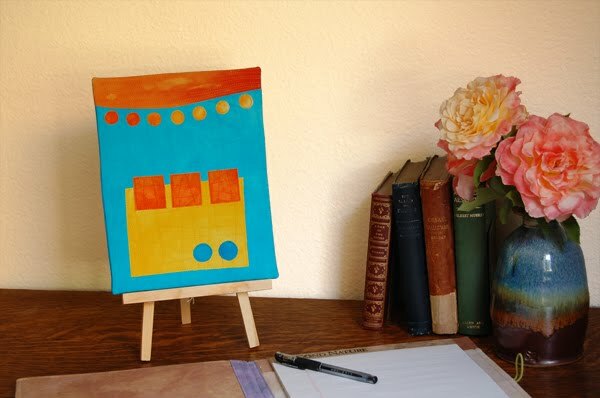 It is on my wish list as I’m taking my novice steps into art quilt making. Candy's work is amazing. Love her knowledge/use of color and her stitching! Thanks for offering this giveaway, Victoria! What beautiful pics you've shared with us, and the personal connection you share with Candy--thanks! 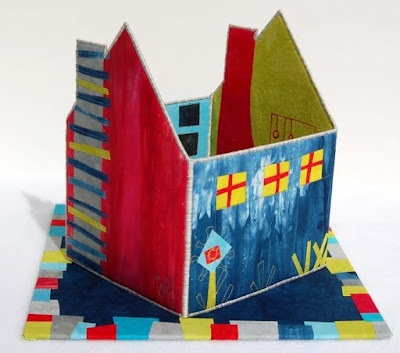 Her pieces are really happy-making, and I'd love a chance to win. It this looks like a wealth of information!!!! What a great DVD, and such a generous offer. Thanks for the opportunity to win this. Please, do your best to make me the winner! I would love to have that. 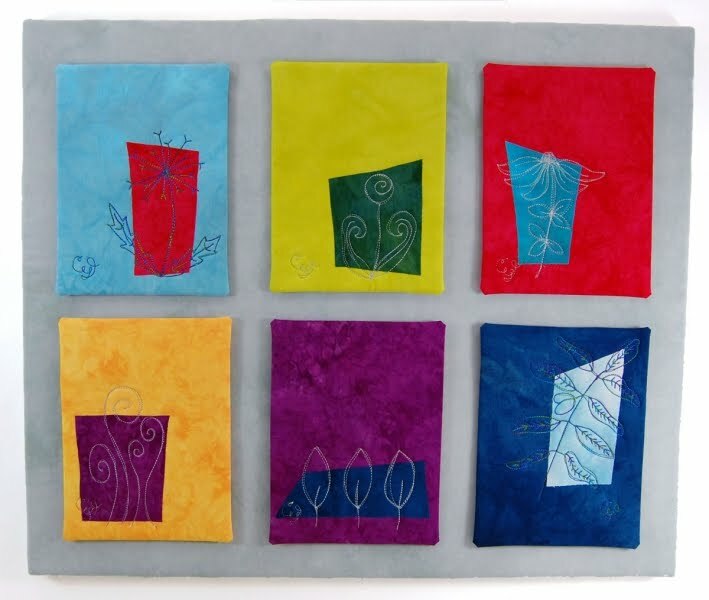 This looks like another great DVD from Quilting Arts! I would love the chance to win a copy. The DVD looks great! I would love to win, thanks for the giveaway. I have tons on hand dyes that I just love to look at. I am thinking tons of hand dye projects would even be better!! Thanks for the giveaway! Guess I have a new video on my Christmas list! I wanted the Dvd before, but now after your description, I can't wait! Thanks for the chance to win! It is great to visit some new and interesting blogs too. this looks like an incredible DVD. Thanks so much for an opportunity to learn more!!! That looks like a great DVD. I would love to learn more about low water dyeing. She has such vivid colors! I just did a bit of dying yesterday, but it sure would be great to know what I was doing! This looks like a great DVD. I love Candy's work. Thanks for the chance to win. I have dyed a lot of wool, but cotton dyeing is a whole different animal (plant!). I would love to learn how to do it. Okay. Until now I've been averse to dyeing using any method. Maybe with Candy's video I can overcome my reluctance and give it a try. Yes, I'd like to win a copy of the video. looks great! she is so much fun! Hi Victoria, I love your work. I'm so glad Candy included you in her tour so I could find your blog. I really enjoy Candy's work too and would love to win her DVD. Thanks for sharing. I read Candy blog and would love an opportunity to learn her techniques. I've been wanting to learn fabric dyeing for a long time. This is very inspirational work. I've done some fabric dyeing and am always looking for interesting ways to use it. Thanks for the many pictures and the giveaway. Some people are just natural teachers ......not me but I sure appreciate the folks that are! Thanks so much for the chance to win this fun and educational DVD. Yum! Her stuff is beautiful. I would love to know how to begin attempting to make such lovelies. I would really LOVE to win!! Otherwise I need to find out how to get that DVD to Sweden. Hi Vicky!!! This book looks wonderful, I want to learn everything! I'm from Argentina, kisses, I always follow your blog, it's amazing!!! This looks like so much fun, and I'd love to add some fun to my life right about now. Count me in, and thanks for the giveaway! Thanks so very much for this opportunity. I think this giveaway needs to come to Northern Canada. Love all the stitching she does on top of the fabric. Would love to win so count me in! This looks fascinating! Looks like she uses the Ives color wheel. I need to tap into her methods. This looks like a wonderful DVD! Please enter me in the drawing! I would love this DVD, winning it might make me even break down and buy a dvd player (right now I watch them at work on my computer). Dyeing my own fabric is an obsession with me! I've been wanting to try dying again. Hers looks like what I would like to achieve. Love the rich colors. Glad you posted this because I'd not heard of her. Thanks for a chance to win, now I'm off to look her up! Looks like a cool DVD, please enter me in the drawing. Thanks! This is a wonderful giveaway. I'd love to learn more about dying fabrics. The hit and miss method is a bit expensive. Very cool! Love the fabric and the cute projects. Thanks for the chance to win! What a great giveaway! I currently dye "by the seat of my pants". It would be wonderful to learn more exacting techniques. I would love to know how to make my own dyes for my fiber supplies! It would make my creations even more unique! It's so great to see talented women helping out others! I'd love to win her DVD. I have never seen your blog--but I love it. What a nice way to give people a way of finding you. I have been dyeing for awhile- but sometimes it is such a mystery. I sure hope I win the DVD. Being a fan of true, bold, and vivid color, this book looks like one I would enjoy immensely! Not to mention that Candy seems to be a unique, fun, and talented individual. I wish her the best with her new book! Thanks for the chance to win! This would be a great tool for our homeschool. Granted the teen boys might not get too much out of the craft aspect (but I can hope), but the color science would work wonderfully. And my daughter, age 8, is all about crafting...super "Mom & Me" time! My email is on my profile. I've been reading about dying for awhile now, but haven't taken the leap yet. This DVD could get me to jump in with both feet. Candy's colors are so vivid and alive. That silk scarf is the most gorgeous thing I've ever seen. I would love to learn her techniques. I have just started to explore hand dying and creating art quilts. This looks like a perfect starting point. Thanks! Interesting, this makes me wonder if I could dye fabric too! Every year I dye Tees for my sons and their families. I use the low water immersion technique and am always look for a way to improve on my results. I am also a quilter so the stitch method shown is of interest as well. I think this CD is just what I am looking for. Yep, that workshop DVD looks comprehensive! And what fun! I have enjoyed your blog, too. I really am beginning to think that being able to make everything you need is the way to go when coming up with sewing projects. Thanks for the chance to win such a great DVD! Okay, you've got my full attention... I would love to get this instructional DVD, as my dyeing efforts have been less than great and I would love to find out what I am doing wrong. Candy sounds like just the enthusiastic teacher to deliver it. I would love to receive this. Ooh, I've been itching to try my hand at fabric dyeing, but just haven't gotten to it yet. This would definitely be the kick in the pants I'd need. Last week I saw Candy in action, via Colouricious and loved the lesson. It was a pleasure to read the blogs you listed. Dyeing has become a new passion with me and I loved your review of this DVD. It seems like something I will just Have To Have. Thanks for the opportunity to win before buying. I have the bottles of dye and now I need the instructions. Hope I win the DVD. The DVD looks great! Thanks for the chance! Super cool. Thanks for the giveaway. Wow, that looks like its so much fun to do; interesting too! Her colors are amazing. I wish I could achieve that. Sounds like an interesting DVD - i would love to win! Thanks! Sounds very interesting. I have never dyed anything . (excluding my hair and that piece of muslin I tea dyed) I'd love to learn more about color. Thanks for the giveaway and a chance to win. Gorgeous! I would love a copy of this book. I've just startet to dye my own fabric. This DVD seems perfect for this learning process! Thanks for the opportunity! I think this DVD looks amazing! 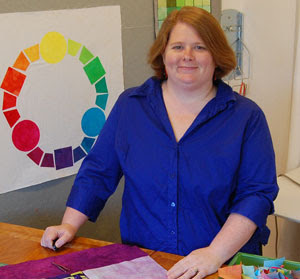 I took a quilt class at Arrowmont from Elizabeth Barton where we did some fabric dying, and it was so fun! When I ran out of fabric, I started dyeing t-shirts and underwear! That was about 8-9 years ago, and I've not dyed since, but if I win this video, that will definitely change! Plus, I desperately want to learn how she does her free motion sketching for botanicals, because WOW! They are so gorgeous! Both of your blogs are so inspiring! Thanks! I would love to learn how to dye fabric like you. Thanks for the giveaway. Looks like a great dvd. I want to Learn, Thanks For The Giveaway. I would love to win this! Thanks for the opportunity. This looks a great DVD to have to easily explain the dyeing process- thanks for the opportunity to win! I think that the "Candiotic Table of Elemental Color" is brilliant!!!! Something that I wanted to try. Please do include me in the drawing! I know I will have to go out and buy this book when it's available. A DVD version of it would be great. Pick me!! Ooooh what an amazing opportunity. The colors, just look at those colors. If only I knew how. Deep breath. would love the chance to win, her color and designs are so fun! I loved her segment on Quilting Arts. She is a talented artist! I found your blog through Susan, and now will become one of your followers. Thanks so much for offering this, the DVD is on my wish list. What freshness there is to her work! I would love the DVD! What fun! The colors are luscious and the stitching engaging... would love a copy of the DVD--- thanks for the chance to win. 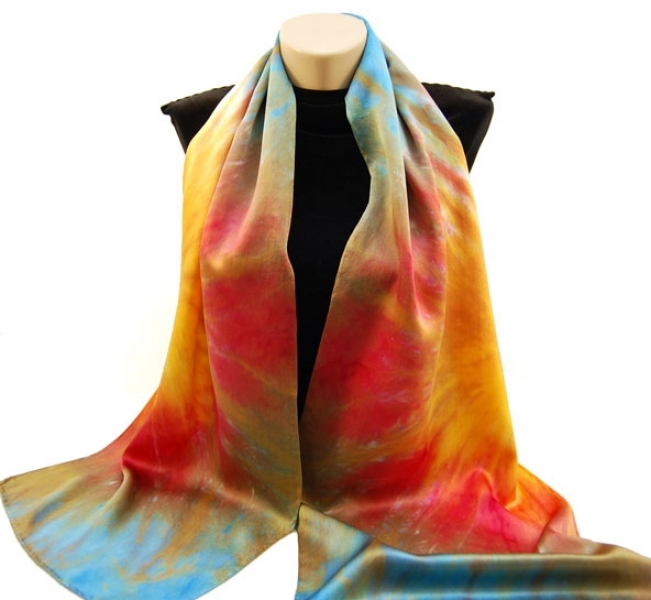 I am so excited about this new opportunity to learn fabric dyeing! Thanks for the review and the chance to win the DVD! Thanks for the chance! She's unmistakenly talented in many ways. 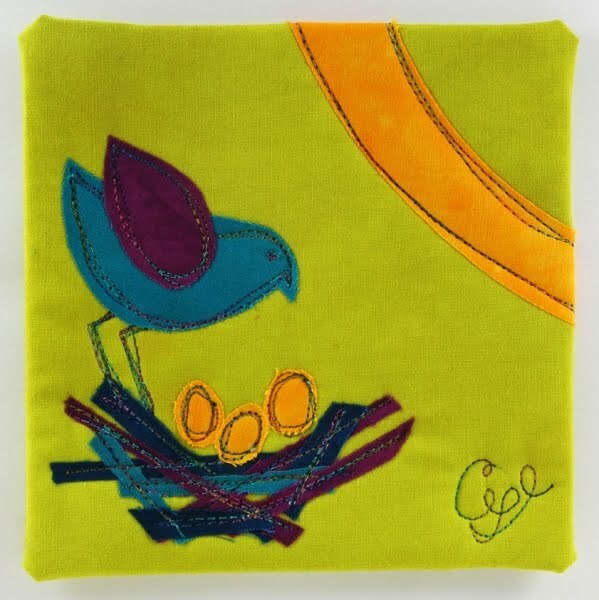 Our PBS station dropped Quilting Arts TV so hope can win this DVD. The name is wonderful, Dyeing to Stitch, and I need all the help I can get on understanding colors and how they are made. Thanks for the informative post on this book blog tour. What beautiful hand dyed fabrics...drool, drool, drool. And I love her creative projects as well. A great addition to one's dvd collections. I have dyed fabric just a few times and am trying to get it down so it becomes predictable. I could really use this DVD! Thanks for the chance! Happy Thanksgiving! Always wanted to dye my own fabric. How cool to be able to have a chance to win the DVD! This looks so wonderful and so much fun! Can't wait to learn more and give it a try! Really interested in learning how to dye - would expand available colour choices fro fabric limitlessly! Candy does beautiful work and I'd love a chance to win the DVD. It would be interesting to do some of my own dying of fabric. Sometimes I just can't find that right color. I love fabric dyeing and would love this video! Thanks for the giveaway. This book looks fantastic! Sign me up! I would love this DVD! I purchased dyes at a quilt show 2 years ago, but have not used them yet. This DVD could be the motivator I need to get past the fear. I'd love to see Candy in action and love to watch crafting dvds. 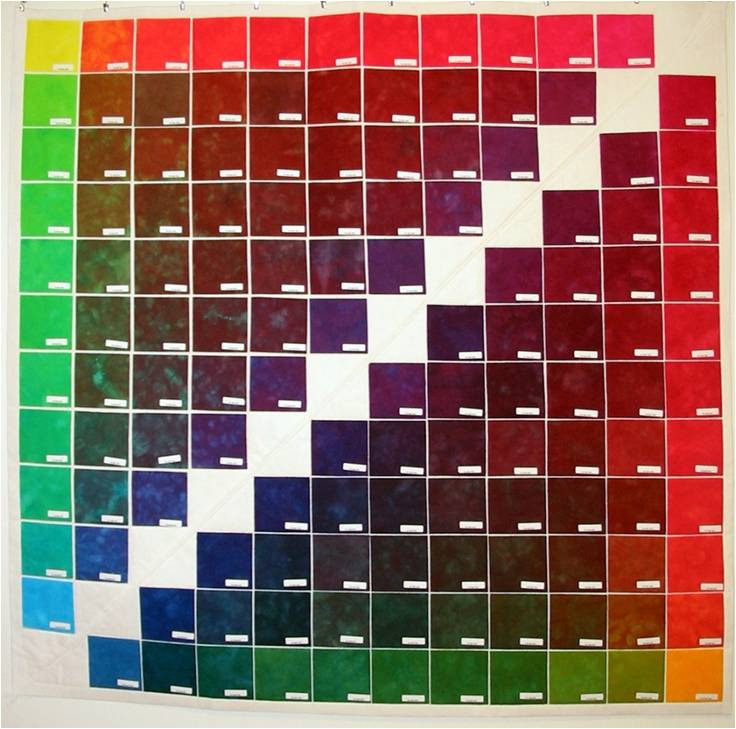 I would love to learn how to dye my own fabrics and build my own pallets. Thanks for the chance to win the DVD. I sure would love to win this! I have been wanting to learn to dye fabrics! Thanks for the giveaway. I am so glad I am following this blog tour. If I wasn't I wouldn't know about this amazing DVD. I can't wait to see what other discoveries I find on this tour. How have I missed knowing Candy!?! I'm a faithful watcher of QA and new subscriber to the magazine. Would love to learn more about dyeing! I recently started dying fabric and she is such an inspiration! Wow, I could learn alot from you! I'm color deficient, and I don't know how to fix it! Please include me in your drawing! 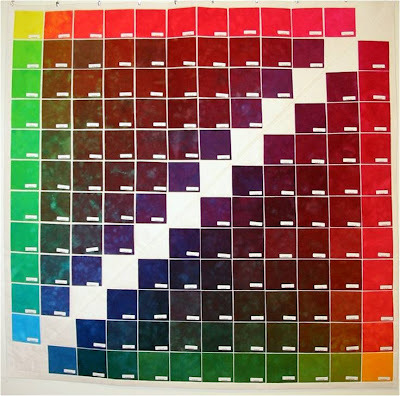 I would love to learn more about fabric dyeing and this looks like a great resource. This giveaway is now closed, and I will be announcing a winner later this week. Thanks to all who entered and good luck!